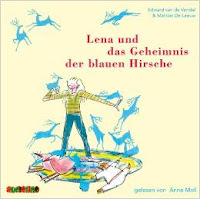 Anne Moll is the voice on my first audiobook, the one that was made by Audiolino of the German translation (by Rolf Erdorf) of my book THIRTEEN RUNNING DEER (DERTIEN RENNENDE HERTJES), under the German title LENA UND DAS GEHEIMNIS DER BLAUEN HIRSCHE. The paper version was released last year by Gerstenberg and the wonderful pictures are by Mattias De Leeuw. Now the audiobook is put on the longlist for the German 'Kinderhörbuchpreis' (Audiobook-award), the BEO 2015. The complete longlist can be found here. The shortlist will be published in September and the winner will be announced in November. Nice news!